“Hermeneutics” is one of those words that you might have heard your pastor use. The English word comes from the Greek ermēneuein, meaning simply to translate or interpret. In short, hermeneutics is that area of theology that has to do with how we interpret texts. Pastors and theologians are particularly interested in how we interpret biblical texts, and we find ourselves reflecting on how we do that. When I told my daughter that I was writing this article and explained what I was going to write about, she said to me, “So you’re going to write about how to read.” Saying it aloud that way makes it seem like a silly kind of question. Yet, if we consider the gap between the time and culture of Jesus and our time and culture, then maybe thinking about how we read and interpret isn’t so silly. 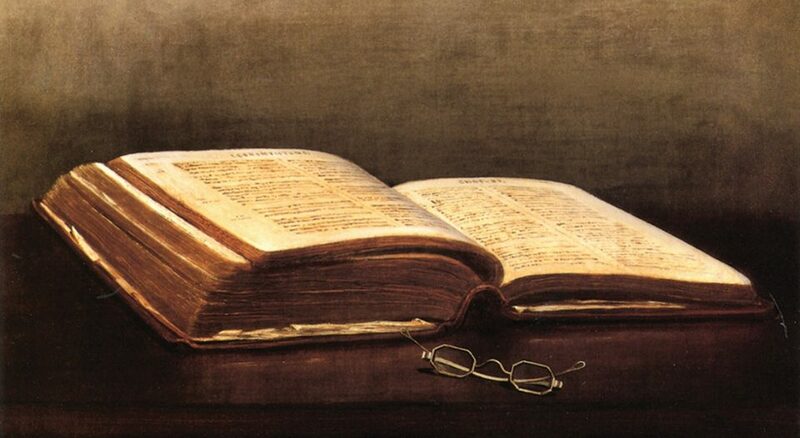 So what are some principles and concepts that Lutherans use to understand the Bible? The first hermeneutical principle has to do with Martin Luther’s central insight that we are justified by faith. Once Luther came to this realization, he began to read and understand all of Scripture through this lens. We aren’t justified by what we do, but we are justified by who we are. This is the gospel. The law tells us what to do, but the gospel tells us who we are: God’s beloved and forgiven children. Scripture contains both law and gospel. The law tells us what to do. The problem, of course, is that we can’t possibly succeed in doing all that we should. No matter how many good deeds we do, there is always one more to be done. The law is a mirror that tells us we fall short and can’t succeed in earning God’s love. The law drives us to Christ. The gospel, on the other hand, reminds us that God loves us and offers us forgiveness of sins and salvation. The gospel reminds us that we are justified by faith. In faith we receive the gift of Christ. When we read the Bible, we encounter the law and gospel. Many Christians say the Bible is the word of God. Luther would agree. However, he said—and Lutherans still say—that the word of God is more than just the Bible. The Word of God is Jesus Christ himself. Luther came to this insight because he began to read Scripture through the lens of justification. John 1 says that the Word is Christ and that we—and indeed all of creation—have received life and grace through this Word. Second, the Word of God is encountered in preaching. The living God who makes a claim on our lives is encountered in those words of our preachers. Sometimes we don’t want to hear those words. They are likely words of the law and are intended to drive us to the gospel. Sometimes in sermons we hear words that comfort and console. These words are likely the words of the gospel. They remind us that we are loved even if we are yet sinners. Luther believed that all believers were called to be priests. They were called to pray for one another and to proclaim the gospel to each other. Just like ordained pastors, the laity—all the baptized—should read the Bible and be familiar with it. Thus he translated Scripture into German so ordinary Christians could read the texts. However, he didn’t mean that everybody gets to decide for themselves what Scripture means. Luther thought Christians would interpret Scripture through the lens of its central message of justification by faith. This work of understanding what Scripture means for us in a certain time and place is done in the church. Lutherans say the church is the assembly of believers. This is to say that the task of understanding Scripture is done with others so we may hold each other accountable to Scripture’s—and Christ’s—claim on us. Reading and understanding the Bible isn’t easy. Scripture assumes a living God. We ourselves are restless creatures with needs that change daily. What we need from God one day is a word that challenges us; another day we may need a word from God that consoles us. Because Christ lives and our lives aren’t the same from one day to the next, Luther said we should pray for the illumination of the Spirit and read the Bible over and over again. When we pray for the Spirit and read Scripture, we will be blessed with an encounter with the Lord of life. Ratke is dean of the College of Theology, Lenoir-Rhyne University, Hickory, N.C.